Spring has finally arrived, and with it we begin looking forward to Commencement. 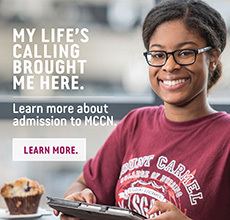 On May 9, the Class of 2015 will receive their Bachelor of Science in Nursing degrees or Master’s degrees and either begin their nursing careers or begin to practice at a higher level. I am eager to hear our keynote speaker, Melanie Dreher, PhD, RN, chair of the board of trustees for Trinity Health, but most of all, I’m eager to experience yet another milestone in my presidency as I am honored to confer the degrees and congratulate each graduate. I’m also looking forward to this summer when MCCN’s newest program – the online Doctor of Nursing Practice (DNP) – will enroll its first class in August. Offering the DNP degree is a major step forward in our commitment to excellence in nursing education. Other degrees/conferring university/certifications: After Mount Carmel, I went on to earn my BSN from Purdue University and my MSN from Indiana University. In addition, I earned a PhD from the University of Northern Colorado. I was certified as an Adult Nurse Practitioner by the American Nurse Credentialing Center (ANCC) before taking additional course work to achieve my current board certification: Family Nurse Practitioner (FNP-BC). I also am a Certified Nurse Educator through the National League for Nursing (NLN). City currently living in: Fort Wayne, Ind. Other degrees/credentials: I am a Certified Critical Care Nurse (CCRN) and have trained in Advanced Cardiovascular Life Support (ACLS) and Basic Life Support (BLS). Current hometown: Columbus, Ohio, where I currently live and work. Professional highlights: Earning my CCRN from the American Association of Critical-Care Nurses was definitely a highlight. I have nearly two years’ experience in critical care and work in the Intensive Care Unit (MICU) at The Ohio State University Wexner Medical Center. Also, I am currently serving in the United States Air Force Reserve as a flight nurse, at the rank of second lieutenant. Alumni Homecoming: Save the Date! On October 24, 2015, from 11 a.m. to 3:30 p.m. we’ll look for your face among the many Mount Carmel alumni who will gather to rekindle friendships, remember good times and to celebrate special milestones of the honor classes (those whose graduation years end in 0 or 5). This year, special recognition will be given to the Class of 1965, celebrating 50 years! Read more: Alumni Homecoming: Save the Date! For the first time, MCCN will offer an online Doctor of Nursing Practice (DNP) program for nurses who want to practice at a higher level. Open to the Advanced Practice Registered Nurse (APRN) who holds an earned master’s degree in nursing, national board certification as a Clinical Nurse Specialist (CNS) or Nurse Practitioner (NP), and a current, unrestricted APRN license, the new online degree program begins this fall, with classes starting August 17. Penny Marzalik, PhD, APRN, program director for the DNP program and associate professor, explains that the DNP is the terminal – or highest level – degree for the nursing profession. Our own Stevo Roksandic Made National News! Stevo Roksandic, MBA, MLIS, AHIP, regional director of Mount Carmel Health System’s Library Services, has been named a “Mover and Shaker” in the library industry in the March 15 issue of “Library Journal,” a national publication. Stevo, who joined Mount Carmel in 2003, was selected for this honor, not only because of his commitment to the profession and his efforts that have expanded library services, but also because he is among those “Movers and Shakers” who are transforming libraries themselves in the 21st century. Read more: Our own Stevo Roksandic Made National News!